Just east of Seattle, rugged mountains cradle one of the Lower 48’s most intact wildlands. Seasonal snowmelt—fed by 519 glaciers—means an abundance of waterfall hikes and ample opportunities to discover how the Cascade Mountains got their name. Some 1.5 million visitors marvel over this 270-foot cataract each year. The falls attract paddlers and day-hikers, with an accessible viewing platform above and a paved pathway to a vista down below. 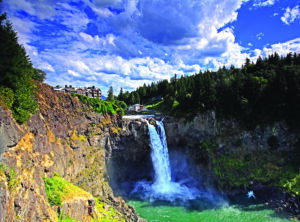 Or go wild in style at Salish Lodge, which is perched at the top of the falls and known for its four-course breakfast. Get here: Drive 30 minutes east on I-90. A parking lot and observation area at the top are wheelchair accessible. Below, find a riverside boardwalk and a kayak launch. This 10-mile hike wends through creeks and among birches and cedars. At 4.5 miles, look for a large cairn (rock pile), then turn left. Scramble up the steep, short slope and glimpse the 1,200-foot-tall waterfall streaming into tiny Lipsy Lake. More views unfurl on the beach below. Get here: Drive 1.5 hours east on I-90 and Middle Fork Snoqualmie Road. Check wta.org/middleforkupdates for details about road closures. Northwest Forest Pass required. A 265-foot-long lace curtain of water crowns this series of nine cascades, viewed at various points over a 5.6-mile round-trip trek. The well-kept trail is one of the most popular in the state and great for families as well as those with dogs. Even better, it’s a year-round hike that is as beautiful under a light mist as it is in full sunshine. Get here: Drive an hour northeast on SR-2. The trailhead is near the parking lot, by the info kiosk. Discover Pass required. The Snoqualmie River pours through a gorge, ribboning into a splash pool before stair-stepping in a second cascade. The double waterfall can be accessed via a gentle 3-mile round-trip path. Nearby, bikers hop on the John Wayne Pioneer Trail, while rock climbers tackle nearly 100 routes. Get here: Drive 40 minutes east on I-90. Take exit 38 to the Homestead Valley entrance; walk 1.5 miles to the overlook. Discover Pass required. Discover Pass $10 per day; purchase online at discoverpass.wa.gov • Northwest Forest Pass $30 per year; purchase online at fs.usda.gov/main/r6/passes-permits *For detailed driving directions and trail information, go to wta.org. Article written by Amanda Castleman for the Visit Seattle Official Visitors' Guide.